World’s First True HTML5 Digital Publishing Tool Is Here! 3D Issue has officially launched 3D Issue version 5. Launched today, Version 5 introduces many new features that add significant value to both creators and end readers alike. 3D Issue version 5 also incorporates easy eBook conversion for Kindle, Nook and other eReaders, as well as the software tool Hubs, a 3D Issue-branded program that converts RSS feeds, web pages and videos into sleek digital magazines. 3D Issue version 5 is built to be completely intuitive and is targeted at the average marketer and publisher without any design training. 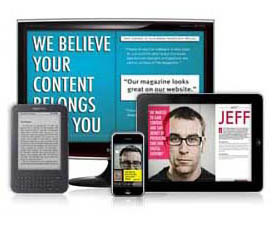 With a simple interface, users can covert PDFs and blogs into readable and engaging digital magazines. Users can add hyperlinks, videos and sound to create interactive publications that go far beyond what print can deliver. Publishers and marketers can easily convert a graphic-dense magazine into an eBook format, or turn an eBook into a magazine, all within minutes.